Necessity is the mother of invention, and Rob Griffin needed a way to fix the issue of blanking out when it comes to grocery shopping. The ‘eureka’ moment came when Griffin observed his son throwing away a ketchup bottle; thus, the GeniCan was born. Along with David Pestka, the GeniCan leaders created a Wi-Fi- enabled product that essentially eliminates grocery-store forgetfulness: you forget to add an item to the list, forget the list at home, the idea of making a list eludes you. You waste money when you buy items you forgot you already had in the fridge; you lose time making multiple trips to the store because you forgot the coffee filters…and then realize you forgot the bananas. 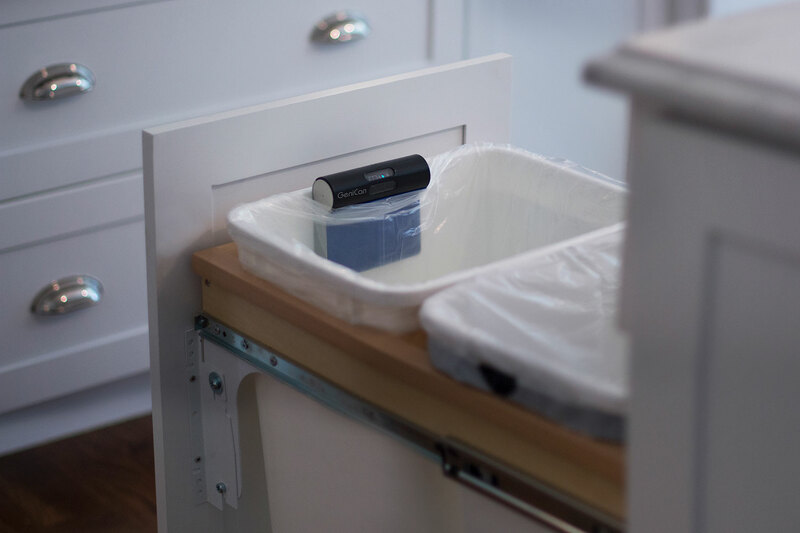 The GeniCan attaches to the side of most square and rectangular garbage bins, and all it takes is a quick swipe of the barcode for the product to register items you need to replenish (it also supports voice recognition for items without barcodes). The product then communicates with your iOS or Android mobile device to track groceries and goods and allows you connect with other household members so they can access the list or add items as needed. If you want to save a trip to the store altogether, you can set up the GeniCan to order items through the Amazon Dash Replenishment program. The battery-powered product comes with four AA Duracell batteries that will last up to a year between replacements. Buyers can pre-order their GeniCans in their choice of red, black, or white through the GeniCan website. Pre-ordered products cost $124.99; the price will change to $149.99 at the end of the pre-order special. The GeniCan debuted at the 2017 Consumer Electronics Show in Las Vegas. Visit the GeniCan website here.